I added Wakakoma restaurant to our “Hitlist” for Sapporo because it’d been featured on No Reservations. I’d watched that episode on one of the weekday nights after work, was sold by Anthony Bourdain’s mouthwatering descriptions and enthusiasm for Wakakoma, and found my tummy grumbling about not getting some of that amazing sashimi heap that Bourdain was happily tucking into. 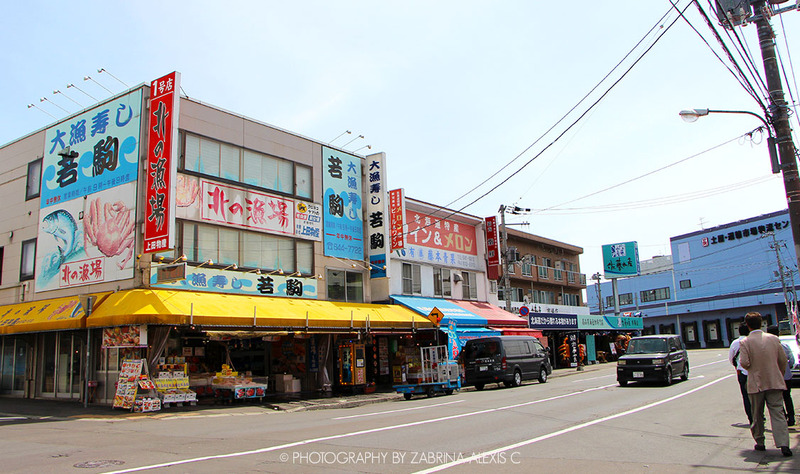 We had a tough time trying to find the place, with the front and sides of the building plastered over in a dozen signs filled with loud Japanese characters and stalls selling fresh seafood on the ground floor, I thought I’d gotten it wrong. I was asking for directions when one of the stall owners finally caught wind of “Wakakoma“, and gleefully pointed us in the right direction and up a narrow flight of stairs that we would’ve otherwise totally missed. Wakakoma was definitely one of the pricest restaurants. The Kaisen Wakakoma Don was 3,780JPY (~$44 SGD)- but was also covered in 13 kinds of seafood and so was totally justifiable in my opinion. Can’t get nothing of that sort in Singapore, no, so might as well go big or go home! It was very good, no doubt. The seafood was fresh covered ever inch of the top of the bowl, and included king crab and botan shrimp. Travelling around Hokkaido, you’d realise that any don (rice dish) with kani (crab) in it never ever comes cheap, and so while it was a pretty costly meal, I thought it was well-priced compared with everywhere else. That said, I wouldn’t necessarily go out of my way to eat at Wakakoma because it was a little out of the way (there was nothing that interesting in the area) and I think you can get some pretty darn decent kaisen dons elsewhere. Sorry Bourdain, but Marutomi Shokudo in Monbetsu was still the best. We alighted at a nearby parking lot and following my GPS, we found ourselves at the foot of a small cluster of buildings, huge signboards plastered on all sides. I led the way down the pavement – a narrow cement path which separated the shelves of fresh produce and seafood to our left and the road to our right on which huge lorries and trucks drove by hurriedly, fetching the day’s catch from the market to, I supposed, restaurants all over Sapporo. I walked up and down that same stretch several times, looking for Wakakoma, and each time seeming to succeed in overshooting the little red dot anchored on the map. A kind middle-aged Japanese lady manning the fruit stall finally figured out what we were looking for and pointed down the row. We’d stopped at regular intervals and turned to her for approval, only to see her wave us farther and farther down the row, until we finally ended up by a small staircase where she nodded and pointed upwards. The staircase opened out into a small restaurant which could seat about 30-40 people. The chef’s table was to the right of the dining area, and dozens of signatures of (I suppose) famous people lined the wall at its entrance which probably meant Wakakoma was a favourite of many. I took no time with ordering at all, considering I already knew exactly what I was there for, and everyone took my cue. 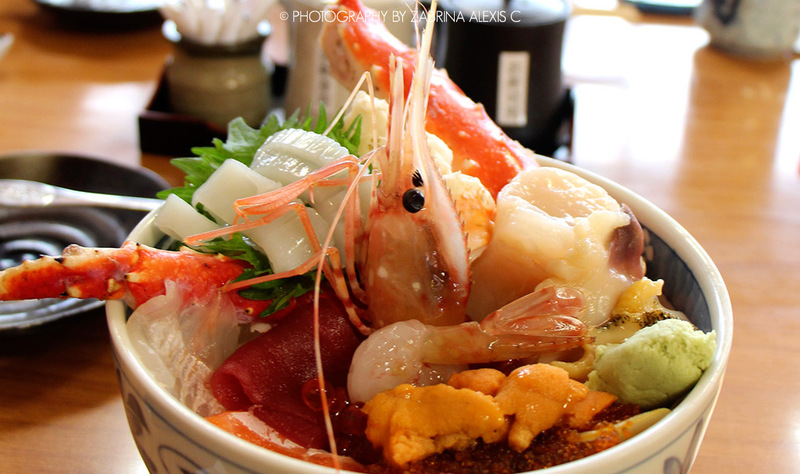 When I saw the Kaisen Wakakoma Don, I’m pretty sure my eyes lit up- I mean, anyone’s would! With a grandiose botan shrimp head triumphantly poking out of the sea of sashimi, I’ll admit I was really excited. While some of it was good – like the hotate (scallops) and kani, others like the ika (squid) and maguro (tuna) fell short; the ika was chewy and rubbery while the maguro was thin and slightly stringy. I’d tried uni (sea urchin) a few times around Hokkaido and had attributed my indifference to the fact that those weren’t the freshest, but even at Wakakoma I was let down in spite of all the uni-campaigning that Bourdain had done. 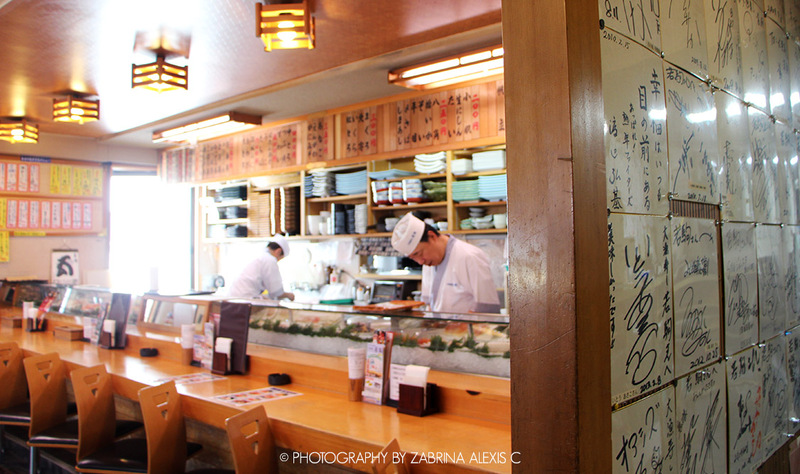 It was only recently when I had the best uni of my entire life at Hashida Sushi, surprisingly or otherwise, back home in Singapore – and that, is a story I’ll share with you in time.